So I finally broke down and bought long pants (that fit) for my three children. It was 40 degrees out when we went to the bus this morning, so I just had to say no to shorts (they’d prefer shorts or nothing over pants). Taking three children out to buy pants is no fun, and my kids are very hard to fit, so I rely heavily on online shopping to get this chore done. I always shop through Ebates, and I’ve been a member since 2008. Why do I love it so much? Ebates is a website that you click through to shop online. 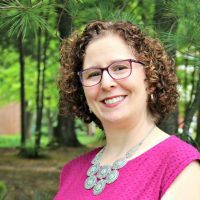 I use it for all my favorite stores–Children’s Place for my daughter’s “slim” pants, Shoebuy for my hard-to-fit wide feet, and more–and each time I earn cash back on the purchases I would make anyway. We just had to replace a dead computer tower, and I got $21 back just for shopping through Ebates. They have current coupon codes for every store, and they even run specials where you get double the cash back (I love those promos). Instead of heading to the store’s website, go to Ebates. 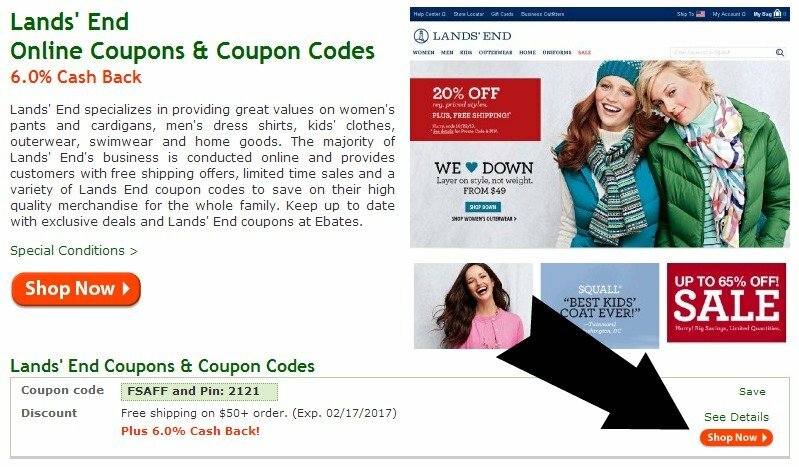 Type your store into the search window, and click on the result (I used Lands End). You’ll see coupon codes, any offers for free shipping, etc. on this page. Click on “Shop Now” to be sure and get credit through Ebates. Complete your order, and once it ships, you’ll get an email from Ebates saying your cash back has been posted to your account. You get paid every three months, so anything you earn between now and December 31st (kids’ clothes, holiday gifts, etc.) will be paid out in February. It goes right to your Paypal account-so easy! You’ll receive the money you’ve earned from your own online shopping, plus any referral bonuses (see below), along with a nice email that says, “Here’s your big fat payment.” I love it! With Ebates’ Tell-a-Friend program, anyone can earn extra cash. You don’t have to know a million people or have a blog. Every single time you refer a friend to Ebates who places a $25 online order in one year from signup, you get an extra $5 cash in your account. Right now, they’re running one of the best promos I’ve ever seen–just refer TWO new Ebates users who place that $25 order by 12/31, you’ll get a bonus $40, giving you $50 total. What an easy way to earn $50! Who do you know who shops online? Make sure they know about Ebates. 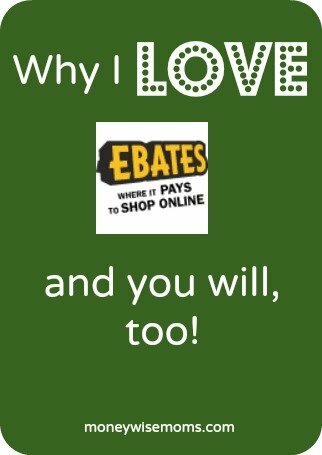 Are you ready to make money with Ebates? Disclosure: This is not a sponsored post, I just really love Ebates and want you to earn money from them, too. I have used my Ebates referral link in this post, so thank you for supporting MoneywiseMoms at no cost to you.